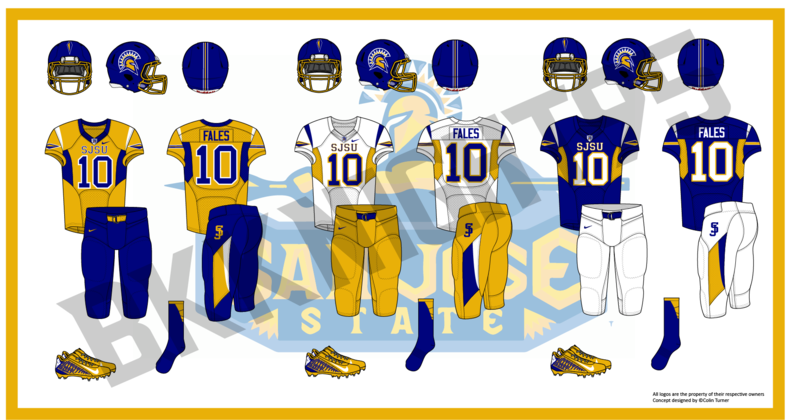 I like San Jose State's uniforms, pit coloring and all. But I wanted to make the uniform a bit more unique than it currently is. -one helmet, blue w/spear stripe. Yellow facemask returns, Spartan head on the sides. -three jerseys. Yellow, white, blue. SJSU on the front. Colored sleeves, underarms. Spear on the sleeves, white on the shoulders. -three pants. Blue, yellow, white. Interlocking SJ on the hip. colored mesh pattern, colored stripe in the mesh. -blue socks and yellow shoes. C and C welcome as always. Sorry, but the SJSU concept just isn't working. Between the armpit panels, the shoulder stripes, the colored cap sleeves, and the arrow logo, it's just way too much at once, and the blue jersey especially looks awkward. I think you give Nike too much credit. Really like the concepts so far. Like UW, never been a fan of the black for them, but I like the addition of the Husky to the pants. In reality, I think what you did originally for PSU would be perfect. But the second concept as a concept is really nice. It's still not quite working because those colored-in panels never look good on any uniform. But it's better than the previous version. Are you taking requests? If so, can you do Clemson? At this point, I am not taking requests. I have a slate of teams I have in mind to accomplish. After that, I might consider it. -one, yes, one helmet. Orange, triple stripe, white/navy/white. Hey BK95. 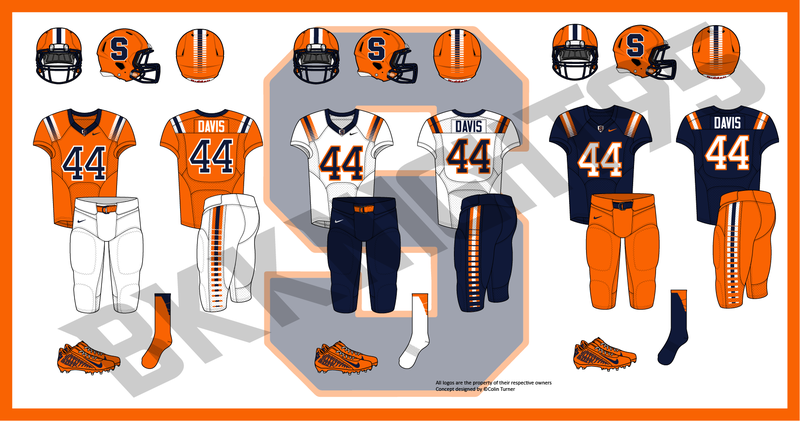 Nice concept on Syracuse's football jerseys. And I can imagine now the uniform combo variations. However, I was hoping to see the number font that was once used on the Syracuse basketball jerseys (during the Carmelo Anthony era). Just kindly suggesting as a mini-tweak. For Syracuse, I think it would work better if the shoulder stripes were solid in the front and then started to break up in the back, like the helmet striping does. I agree. It's a nice role of thumb. Almost conveys the idea of speed or motion. I've really enjoyed this series. Nice, clean presentation. Watermark could be toned down a tad though. Flipped the stripe so the speed pattern is toward the back of the uniform. Much better now with that shoulder striping. Looks great. I don't like the inconsistency between the Navy colored things and the Orange colored things, either make them all Color outlined in White or all White outlined in color. 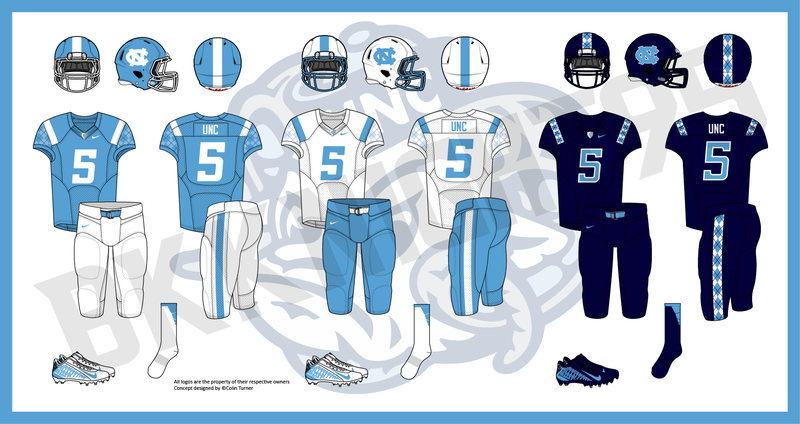 -white helmet and carolina blue helmet. Single color outline. -white and caro. blue jersey. Subliminated argyle pattern on the sleeves. Shoulder stripe. Kept the new font, I like it. -white/caro. blue pants, single stripe. -navy blue uniform is for rivarly games, and any other big games. It is not interchangeable. -argyle replaces the stripes from the home/away jerseys. Despite the new font (whose name I don't know yet), this UNC concept jersey looks very traditional and sleek. Amazing job BK. I feel like I'm messing too much with tradition, then I remember what Adidas designed for UM this year, so I felt better. -home has no white, keeping with tradition. whites have both maize and blue. -the two uniforms on the right are for big games, rivalry games and are not interchangeable, pants can be. The normal home & road uniforms of Michigan look very sleek and modern, despite showing its traditional ways. I like it to be honest. But with the TV numbers on the shoulders, it'll be just right. And if there was combos, it would be awesome to see an all-blue for an alternate home, and a white-over-blue for an alternate road.